Thumb through any design magazine and you often see articles focused on room makeovers, budget redesigns, and do it yourself projects aimed to enhance the beauty of a room. In doing just that and reviewing the Fall 2010 issue of Do It Yourself Magazine, a Better Homes and Gardens publication, we noticed several examples where designers were using curtains instead of doors. We wanted to share several examples with you to help inspire your "inner designer!" The first was a nursery transformation by John & Sherry Petersik, bloggers at younghouselove.com. 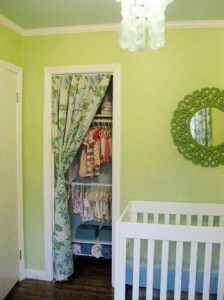 As shown below, they opted to replace the closet door with a curtain. This option frees up space by eliminating the space for the swing of the door, allowed them to utilize the terrific look of a fabric whose color and patter complimented their overall design scheme, and hides the storage area as required. Despite our obvious bias towards tracks, we do think the use of a curtain track instead of static attachment or a rod would have made opening and closing the curtain and accessing the contents of the closet a bit easier. But we share this image with you since we learn of more and more customers following this same lead and using curtains to conceal storage areas while also adding style and flair to their decor and thought this was another fine example. In that same magazine, another designer used smaller fabric panels instead of doors to conceal kitchen cabinets. In that design (sorry, we could not locate an image to share online), swing arms were used to support and move the fabric panels. However, a curtain track mounted on the cabinet frame would certainly have provided a viable alternative (and likely less expensive as well). 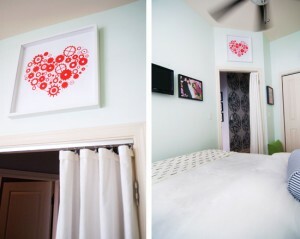 As a further example of a door being replaced by an attractive curtain panel, we point to the bedroom door shared by Curtain-Tracks.com customers Kim and Scott (some of our favorite bloggers at YellowBrickHome.com.) They have used ceiling mounted curtain tracks purchased from our site on several of their design projects, and this particular project was pertinent to this discussion on replacing doors with curtains. The bottom line is hanging a new door isn't the simplest project to tackle. However, if you have any sewing talent at all or can locate and off the self curtain panel that appeals to you, a fabric curtain can quickly provide an enhanced look, privacy, or conceal storage quickly and inexpensively. If you need advice around curtain track selection, feel free to contact us! Perhaps a curtain door is in your near future? If so. we are here to help.